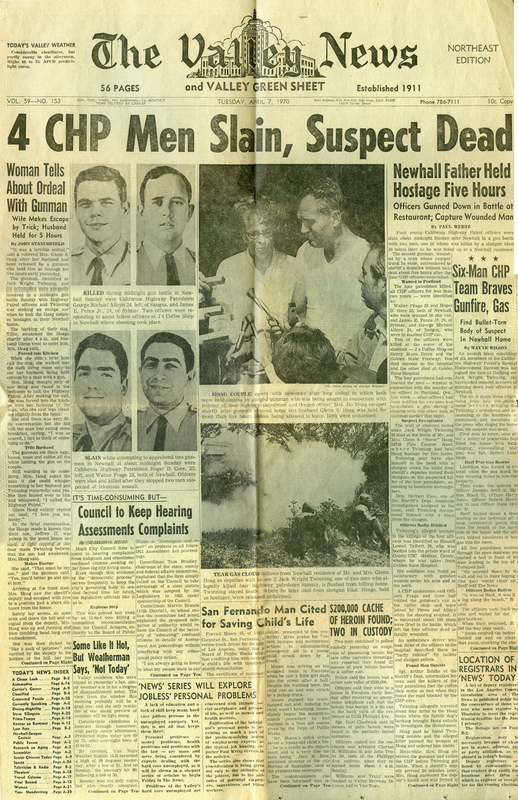 The Valley News and Valley Green Sheet: The Newhall Incident, 4-7-1970. They called it the "Newhall Incident." It was the worst massacre of police officers in the 80 year history of the California Highway Patrol, and possibly the worst in American history. It changed police procedure forever thereafter improved police training on how to approach a suspect, better weaponry, bullet proof vests  saving the lives of many police officers in the line of duty. It was the story of the bravery and sacrifice of four young CHP officers, and the story of a true American hero, a civilian bystander who risked his life under fire from gun toting suspects to try to save the life of a downed patrolman.On the evening of April 5, 1970, four CHP officers, Roger Gore, Walt Frago, James "Skip" Pence, and George Alleyn were brutally gunned down by two dangerous suspects in the lot of a Standard Service Station next to J's Coffee Shop on what is now the intersection of the Old Road and Magic Mountain Parkway in Valencia, California. The two suspects were down and out career ex-convicts. They had met and became friends while in prison. Jack Twining had just been released from the Federal Penitentiary in Tallahassee, Florida eleven months previously. At age 34, he had been in and out of eight federal prisons for various offenses since the age of 16. Bobby Augustus Davis had been released from prison 8 months previous and was serving his parole time in Houston, Texas. Both had tried and failed to land legitimate jobs after leaving prison. They met again in Houston and rode out to California to turn back to the "dark side" and score a big hit. After staying for a while in Sacramento and failing to pull off an intended bank robbery, they rode down to Los Angeles in a red Pontiac. As they drove south on Highway 99 between Gorman and Newhall, they noticed lots of construction along the highway and figured they could come back to steal explosives from the construction sites when they were ready to pull a robbery. In the car with them was a veritable armory of guns. The CHP officers flashed the red lights of their patrol vehicle as Gore got out to apprehend the suspects. While Gore patted down Davis, Frago covered him with a shotgun. Suddenly Twining got out of the car and fatally shot Frago with two bullets from a .357 magnum. The horror had begun. Distracted by the gunfire from the passenger, Gore could not react in time as Davis shot him with a Smith and Wesson revolver. Never before had so many officers been killed in one incident. In the aftermath of the shooting, the two suspects took off in opposite directions by foot. Davis headed up San Francisquito Canyon Road where he was apprehended by police officers. He was eventually convicted and sentenced to death. His sentence was changed to life in prison when the California Supreme Court outlawed the death penalty. He remains in prison to this day. Twining ended up barricaded in the home of Steven and Betty Jean Hoag on Pico Canyon Road near the Old Road, where he shot himself to death when the house was surrounded by the police. He had previously sworn that he would never return to prison. The Newhall Incident left in it's wake four young widows and nine fatherless children. Sympathy poured in from a stunned community as over 5000 letters were sent to CHP headquarters with nearly $100, 000 in donations for the families. But Gore, Frago, Pence, and Alleyn did not die in vain. As a result of their sacrifice, police procedures were re-examined and changed, making the jobs of police officers across the country much safer to this day. Many more lives of police officers may have been lost if not for the tragic loss of life on the worst day in the history of the CHP.